This story will only be available for 24-hours. Or it would be if it appeared as a Story on Snap Inc.’s iconic Snapchat app. Unless deleted by you, other social networks keep everything you post, but with Snapchat, there is no history. Everything is temporary: opened Snaps disappear within seconds, Stories are only available for 24-hours, and even unopened Snaps disappear after 30-days. Although Snapchat was an almost immediate success with 18-24 year olds, attracting seed funding in early 2012 couldn’t have been an easy task for a then 21-year old Evan Spiegel, and 23-year old Bobby Murphy. Since then, Snapchat has continued to confound some, and delight others, all leading to an impressive IPO in early 2017, with the company valued in the $20bn-$30bn range. Most companies with multiple founders inevitably end up with one founder receiving the lion’s share of attention, becoming the unofficial face. 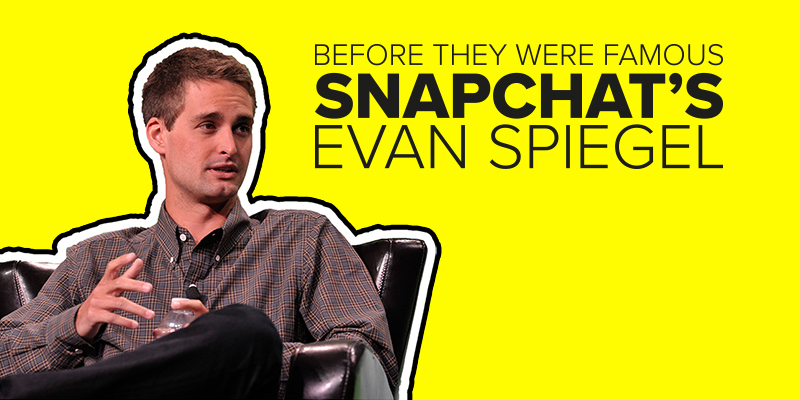 And with Snapchat, that face belongs to Evan Spiegel. His parents were both successful lawyers, and Evan grew up in the Pacific Palisades, attending the exclusive Crossroads School for Arts & Sciences. Part of his privileged upbringing included spring breaks in Maui, summers at La Jolla’s Beach and Tennis Club, vacations to Europe, frequent shopping sprees, a personal chef, and even snowboarding by helicopter in Canada. But this unfairly suggests an early life of fun, with no ambition. A journalism class he took at Crossroads involved not only writing for the school newspaper, but also selling a certain amount of advertising. Evan’s 10th Grade English teacher, Mitch Kohn, remembers him as a student who exceeded his sales goals, and helped coach the other children. It was also around this time that Evan enrolled for two continuing-education courses at the Otis College of Art and Design in Los Angeles. This after he became fascinated with design. During his senior year at Crossroads, Evan managed to spend time as an unpaid intern at Red Bull, exposing him to various marketing and design projects. This might have inspired him to take a class at the Arts Center College of Design shortly before he started studying at Stanford, even though once he started at Stanford he appeared to be unsure of what he wanted to do. Evan’s initial uncertainty over what he wanted to do after college saw him work as a paid intern for a biomedical company, and later as a careers instructor in South Africa. A family friend allowed Evan to sit in on an entrepreneurship and venture capital graduate-level class, which included talks by Google’s Eric Schmidt, YouTube’s Chad Hurley, and Intuit’s Scott Cook. These talks inspired Evan, who befriended Scott Cook, and landed a gig working with Scott and another engineer on txtWeb. After the Intuit project, Evan launched futurefreshman.com with fellow fraternity brother, Bobby Murphy. 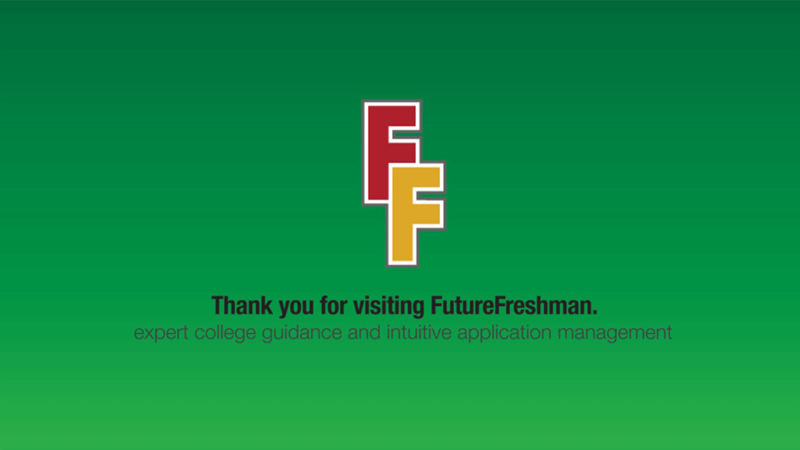 The short-lived site was meant to guide users on how to manage college applications, but work on Pictaboo soon replaced work on futurefreshman.com. The original idea for Pictaboo came from Reggie Brown, another fraternity brother who wished the photos he was sending to a girl could disappear. 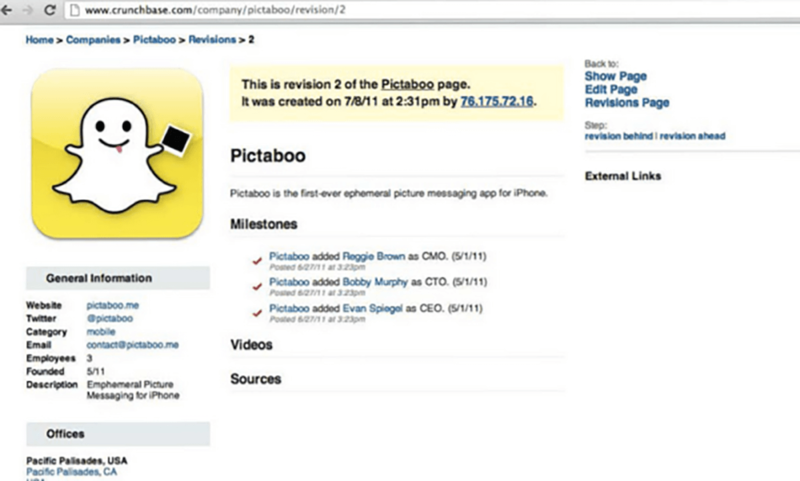 The idea interested Evan, and during the summer of 2011, Evan, Reggie and Bobby worked on Pictaboo. Bobby coded the app, which launched in July 2011, and the original company structure had Evan as CEO, Bobby as CTO, and Reggie as CMO. A less than spectacular launch, and disagreements between Evan, Bobby, and Reggie led to the latter being ousted from the company a few weeks later. During the autumn of 2011, Evan and Bobby made changes to the app, relaunched as Snapchat, and began marketing to high school students. Things were much more successful this time around, and by the end of 2011 they had more than 1,000 daily users. 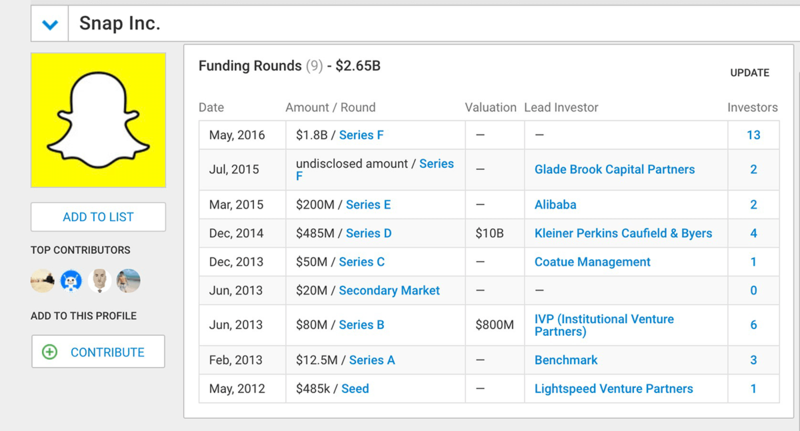 By the time they landed their seed round of funding in April 2012, they had 100,000 users. And the rest – as they say – is history. Or myth. Of course, Evan Spiegel is now part of that fairytale. Soon after receiving $485,000 in seed funding, Evan dropped out of Stanford to focus on Snapchat full-time. It is a fairytale that doesn’t always have a happy ending but does always have highs and lows. Although Evan’s fairytale does have a happy ending – for him, anyway – it has also had some spectacular highs and lows. In February 2013, soon after landing a round of Series A funding, Evan and Bobby were confronted with their first lawsuit – filed by Reggie Brown. The lawsuit would drag on well into 2014, before finally being settled with a $157.5m payout for Reggie Brown to disappear like a Snap. Despite the lawsuit, the founders were still able to attract funding, with Series B and C concluded before the lawsuit was settled, and Series D soon after. And this also in spite of Evan rejecting a $3bn offer from Facebook in December 2013. Many wondered at the time if Evan would come to regret this, but with a personal net worth that currently exceeds what Facebook originally offered, it’s doubtful Evan has any regrets. and he has since managed to avoid any further personal controversies. 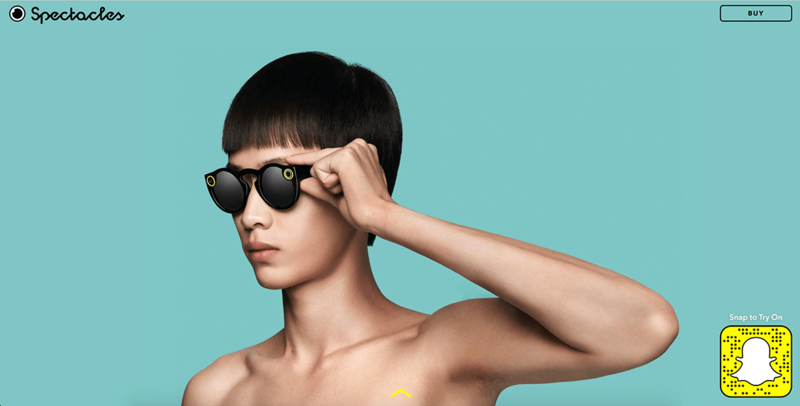 At the same time, the company announced a new product: Spectacles, sunglasses with embedded cameras. So it isn’t too much of a stretch to accept that Snap Inc. is indeed a camera company; they just happen to be more well known for their social app.